Before it gets warm you need to make this recipe. It is so yummy and perfect for a cold winter night. But if you're like me, I don't like to eat soup when it's warm out. 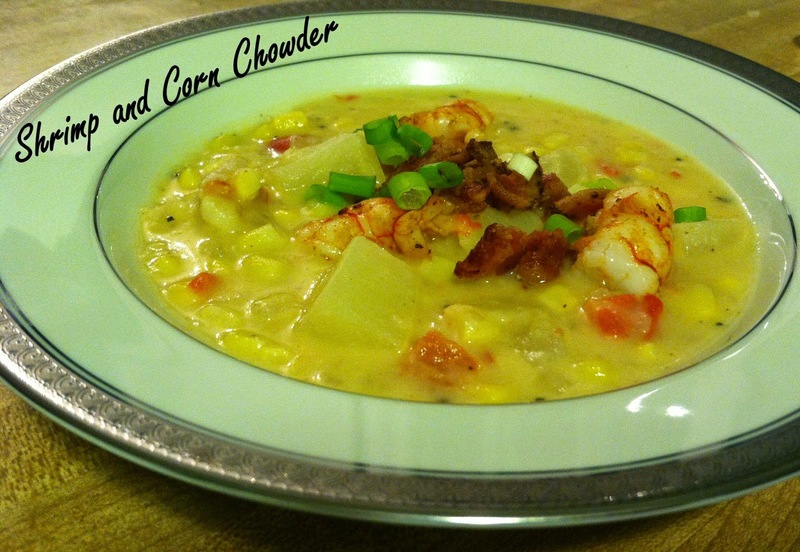 I adapted the recipe from several different versions of Shrimp Chowder. I took what I liked from each of them and made it a few times before I perfected it. Now I have to warn you, this is not a healthy version but it is rich and delicious. 1. Cook bacon until crisp and remove from heat. Crumble the bacon once it cools. When the bacon is finished saute the shrimp in the bacon grease and remove from heat. 2. Meanwhile chop onion and potatoes into 1/4" pieces. 3. Heat olive oil in med sauce pan. Saute onions with salt and pepper for 5 mins. 4. Add potatoes, wine, and 2 cups of vegetable broth to the onions and bring to a boil. Turn down the heat once the mixture boils and simmer for 15 mins. 7. Stir in corn and heat. 8. Add shrimp and heat for 1 min. 9. Pour the soup into bowls and top with crumbled bacon. I've made this soup a few times this winter and we love it! It's perfect for date night since it make enough for both of us with a little left over for lunch the next day. Mmmm...looks delicious! I love corn and shrimp! I may have to make it without the bacon though. I know, I'm one of those very strange people that does not like bacon. This looks fantastic! Thanks for the recipe! I have been on a soup making kick for the past couple weeks, so this will be great!